Shelly Klein has run k studio in its various forms for ten years working as a consultant for the contract furniture industry with a range of clients including Herman Miller. Also an accomplished painter, she uses overlapping imagery in both her paintings and textile work. The two mediums feed one another and create a dialog that their clients continue to find fresh and exciting. Mary Klein is a veteran of the contract furniture industry with extensive management and manufacturing background. She manages the nuts and bolts of the operation with skill and ease and is a collaborative partner in all design decisions. She also manages research and sourcing. The combination of their respective areas of expertise have resulted in a natural mother/ daughter collaboration exploring a shared interest in combining good design with sustainable materials, business acuity, and social responsibility. Availability: Ships in 8-10 business days. Great design, green materials, and social responsibility need not be at odds with one another. In fact, at k studio they think these ideas are inseparable. They started this company with just this idea in mind. At Shelly and Mary Klein's growing studio in Grand Rapids, Michigan, they manage each product from start to finish. They start with fabric made from some of the most sustainable materials available such as hemp, organic cotton, and recycled wool. K studio designs are generated in house and are then embroidered, assembled, packaged, and shipped by their skilled team. 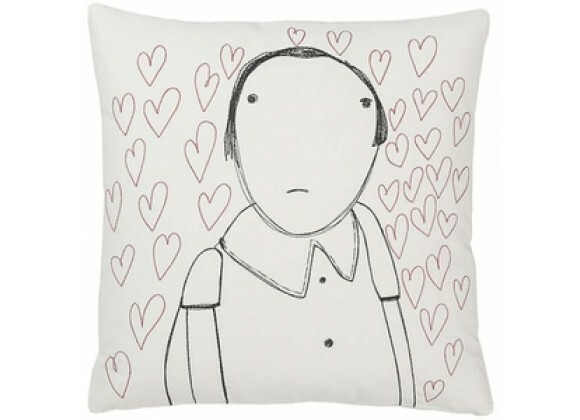 Embroidered portraits of strange characters adorn these organic cotton pillows. The back of each features one small detail from the front. Materials: Off-white organic cotton with black and red stitching. Down/feather insert. Zipper closure. Made in the USA. Dry clean only. Images show front and back designs.